Weekend Historical Happenings: 11/17/12 - 11/18/12 ~ The History Girl! Children and families are invited to "The First New Jerseyans" on Saturday from 2:00 - 4:00 pm. Visitors can make a musical instrument, try outsome Lenape recipes and join us for games, crafts and more based on the Lenape, the first New Jerseyans. This event will be held at the Corson Poley Center at the Burlington County Historical Society, 454 Lawrence Street. Free parking on High Street and in the Society's parking lot on Lawrence Street. Admission is $5 per person. RSVP recommended for this program. For more information call 609-386-4773 or e-mail burlcohistsoc@verizon.net. Join the Tuckerton Historical Society for an Old Barney Amateur Radio Club presentation on the history of the Tuckerton Wireless at 2:00 pm on Saturday. Amateur Radio demonstrations will take place between 12:00 noon and 4:00 pm. This presentation will be held at the Giffordtown Schoolhouse Museum, 35 Leitz Blvd., Little Egg Harbor. For more information call 609-294-1547. 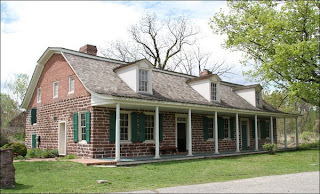 View a colonial cooking demonstration and mincemeat pie sale with an exhibit on the history of Brick's Mincemeat on Saturday from 11:00 am to 4:00 pm at the Chesterfield Township Historical Society Headquarters, 2 Front Street, Crosswicks, NJ. Open hearth cook Mercy Ingraham will demonstrate authentic colonial cooking methods with a focus on preparing a traditional Thanksgiving meal, and preserving food for the winter. Mincemeat pies are homemade using a recipe based on the traditional Brick's Mincemeat recipe, which was created and manufactured in historic Crosswicks Village for decades. Celebrate a weekend of Revolutionary War living history at the 236th anniversary of the fall of Fort Lee on Saturday from 10:00 am - 5:00 and Sunday from 12:00 noon - 4:00 pm at Fort Lee Historic Park. Enjoy two days of demonstrations, re-enactors in camp, music, and artillery. In September of 1776 the British took New York City and the rest of Manhattan except for Fort Washington. On November 20, just four days after taking Fort Washington, General Howe ordered General Charles Cornwallis to convey 5,000 men across the Hudson several miles north of Fort Lee. When word of the advancing army reached Washington, he ordered an immediate retreat, before the Fort Lee troops could be cut off and captured by the British force. Most of the American supplies and artillery had to be left behind. These were indeed among the darkest days for the cause of American liberty. Admission to the events are free but there is a $5.00 parking fee. 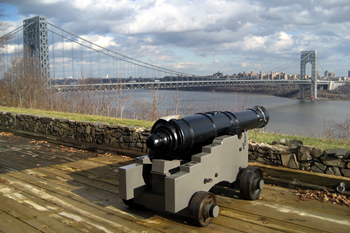 Fort Lee Historic Park is located at Henry Hudson Drive in Fort Lee, just south of the George Washington Bridge. For more information, please call 201-461-1776 and visit http://www.njpalisades.org/retreat_schedule.htm for a full schedule of events. The Bergen County Historical Society will proudly commemorate the 236th Anniversary of the British invasion of New Jersey with a weekend of living history and scholarly presentations at the site of the Bridge that saved a Nation. At 7:00 pm on Saturday night in the Steuben House, military researcher and historian Todd W. Braisted, a Bergen County Historical Society past president, will present a lecture on chapters from his new book, Bergen County Voices from the American Revolution: Soldiers and Residents in Their Own Words. The book covers the David Demarest Family of New Bridge, Loyalist father/husband, Whig wife & son. Afterwards, visitors may enjoy light refreshments at the Campbell Christie House, along with living history members portraying the soldiers and followers who took part in the Revolutionary struggle from that time. On Sunday, between 11:00 am and 4:00 pm, members of various living history groups representing both sides of the conflict perform military demonstrations during the course of the day, showing the life and times of the common soldier of the American Revolution. Cooking and baking demonstrations will likewise take place in the out-kitchen behind the Campbell Christie House, and visitors may tour the historic homes on the site. At 1:00 pm on Sunday, Todd Braisted will speak on the British Invasion and the fall of Fort Lee. Some of the society's treasure of Revolutionary War artifacts will likewise be on display over the weekend. 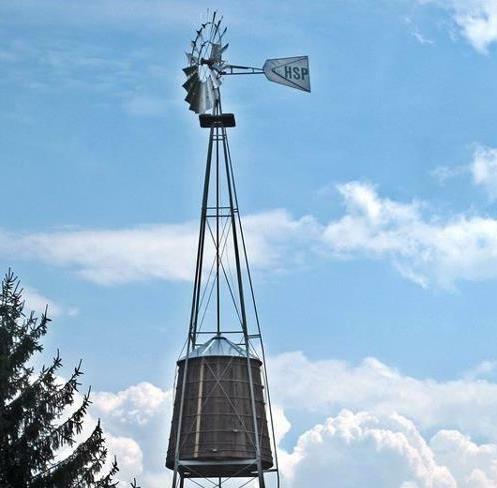 The Harding Township Historical Society has rescheduled its Annual Antiques Show and Sale at the Tunis-Ellicks Home at 16 Village Road, New Vernon, NJ 07976 for Saturday and Sunday between 11:00 am and 4:00 pm. Believing strongly that antiques shows constitute an important way to educate the public about history and are major resources for restoration and period furnishing, the society rescheduled the show, its 29th, to provide the Northern New Jersey public with the opportunity to see period antiques in an appropriate setting and to add to their collections and restorations. Admission is $6.00. For more information, call 973-292-3661. Andover Borough has a very fascinating and interesting historical past. The Andover Museum's historical displays will be changed regularly throughout the year in order to highlight and showcase some of the prominent residents, important events, and significant properties and buildings of the area. In addition to the historic displays, the society also has a nice collection of gift items for sale, including the Andover Borough Afghan, glass ornaments, and note cards, all depicting scenes and buildings of this historic town. This month's exhibit will feature election day, political figures and Christmas. The Andover Museum is open to visitors from 1:00 - 4:00 pm this Sunday. It is located upstairs in the Andover Borough Municipal Building at 137 Main Street/Route 206, Andover Borough, NJ. There is ample parking located behind the building and the museum entrance is on Smith Street. Take a step back in time, and visit the Historic Village at Allaire for their 19th century "Our Day of Thanks" Celebration! Learn all about this "new" holiday with authentically clad villagers on Sunday from 12:00 noon to 3:00 pm in the restored iron-works company town, decorated for the occasion. A service will be held in the Chapel, at 1:00 pm with a sermon based on the year's harvest. The Historic Village is decorated for the festivities and visitors are invited to Manager's House where interpreters will demonstrate how a Thanksgiving feast was prepared in the early 19th century. As the savory scents of roasting turkey waft through the village, there will be hands-on demonstrations of cider pressing and opportunities to join in some 19th century games. Artisans will be in their shops to demonstrate and explain the arts of blacksmithing, carpentry, and tinsmithing. The General Store and Bakery will also be open for holiday shopping and decorated for the festivities. A fun way to kick off your holiday season with the entire family! The Historic Allaire Village is located in Allaire State Park at 4263 Atlantic Ave in Farmingdale, Monmouth County. For more information, contact Allaire Village during business hours, Monday through Friday, from 9:00 am to 5:00 pm at 732-919-3500 or visit www.allairevillage.org. Join us for a tour of the Reeve History & Cultural Resource Center open to the public from 1:00 to 3:00 pm. This beautiful home was built in the 1870s. It was renovated by the Westfield Historical Society and now houses items and collections related to Westfield. The center is located at 314, Mountain Avenue, Westfield NJ. For further information call 908-654-1794 or visit www.westfieldhistoricalsociety.org. Ceremonies and festivals to give thanks and show gratitude for good fortune are traditions that date back to ancient times. On Sunday, the Miller-Cory House Museum will be continuing a tradition of its own by presenting the annual Thanksgiving dinner and table customs program. Between 2:00 and 4:00 pm, cooking committee members will be demonstrating the preparation of a colonial Thanksgiving dinner over the open hearth. Visitors will also learn about authentic early American manners, place settings, and other interesting “table top traditions.” Admission is $3.00 for adults and children 13 and older, $2.00 for children ages 3 to 12, and free under age 3. The Miller-Cory House is located at 614 Mountain Avenue in Westfield. Join the Burlington County Historical Society on Sunday from 2:00 - 4:00 pm as they welcome Carl Jablonski from the Navy Lakehurst Historical Society. Carl Jablonski, director of the Navy Lakehurst Historical Society, will discuss the Hindenburg Disaster and share his collection of artifacts and photographs. There will be a Q&A session and light refreshments after the talk. This event will be held at the Corson Poley Center at the Burlington County Historical Society, 454 Lawrence Street. Free parking on High Street and in the Society's parking lot on Lawrence Street. Admission is $5 per person. For more information call 609-386-4773 or e-mail burlcohistsoc@verizon.net. Join the Somerset County Historical Society on Sunday at 2:00 pm at the Van Veghten House for a presentation by Mark Di Ionni, an award-winning journalist and author, as he speaks about the Lindbergh Kidnapping and the Press. The Lindbergh kidnapping and subsequent trial was one of the most highly publicized events of the 20th century. 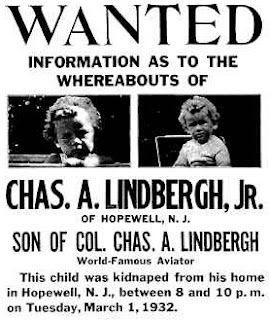 Charles Lindbergh’s 20-month-old son was abducted from his family home near the town of Hopewell, New Jersey, on the evening of March 1, 1932. The boy’s body was discovered two months later a short distance from the house and the medical examiner determined that the cause of death was a massive skull fracture. After a two-year investigation, which turned into media circus, Bruno Hauptmann was arrested and charged with the crime. His trial was held at the Hunterdon County Courthouse in Flemington, New Jersey, from January 2 to February 13, 1935. Hauptmann’s chief defense counsel was Edward Reilly, who was hired by the Daily Mirror. Reilly was assisted by two other attorneys: Lloyd Fisher from Flemington and Frederick Pope from Somerville. Hauptmann, who proclaimed his innocence to the end, was found guilty of first degree murder and sentenced to death. He was electrocuted at the New Jersey State Prison on April 3, 1936. Mark will discuss the role of the press during Lindbergh kidnapping investigation and subsequent trail. The Van Veghten House is located at 9 Van Veghten Drive in Bridgewater. How Green is Green Construction? 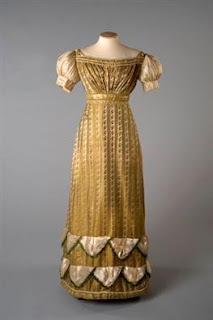 "Fashions in the Age of Austen"
This Sunday at 4:30 pm, join Macculloch Hall Historical Museum Executive Director Carrie Fellows in an exploration of women's fashion encompassing 1790 - 1817. Using images from the period, photos of surviving garments, silhouettes in the Museum's collection and hand sewn reproduction clothing, Fellows will illustrate the Regency silhouette. This program is presented in conjunction with the current exhibit in the school room gallery. On display are vivid examples of the antique Oriental rug collection will be hung in the museum's first floor gallery, complemented by textbook examples of fine porcelain, silver, glass and furniture collected by Museum founder, W. Parsons Todd. "A Fine Collection: Treasures from the Vault" has a perimeter layout which leaves the center of the room open for a series of speakers and musical programming taking place in conjunction with the exhibit over the next several months. Tickets for Sunday's program will go on sale at 1:00 pm on the day of the program, no advance sales. House tours (regular admission applies) take place throughout the afternoon; the last tour leaves at 3:00 pm. The upstairs galleries will remain open until 4:30 pm. The "A Fine Collection" exhibit will close at 3pm in preparation for the program. Tickets for this program are: Adults $8; Seniors & Students $6; Children 6 - 12 $4. Members and children under 5 are free. Speaker tickets include admission to take part in a house tour if visitors arrive during the afternoon and sign up to tour. Macculloch Hall Historical Museum preserves the history of the Macculloch-Miller families, the Morris area community, and the legacy of its founder W. Parsons Todd through its historic site, collections, exhibits, and educational and cultural programs. The Museum is open to tour the house and view exhibits on Wednesdays, Thursdays & Sundays from 1:00 to 4:00 p.m. Adults $8; Seniors & Students $6; Children 6 - 12 $4. Members and children under 5 are free. The last tickets for admission are sold at 3:00 p.m. Call the Museum weekdays at (973) 538-2404 ext. 10, or visit www.maccullochhall.org. Macculloch Hall Historical Museum is located at 45 Macculloch Avenue in Morristown.